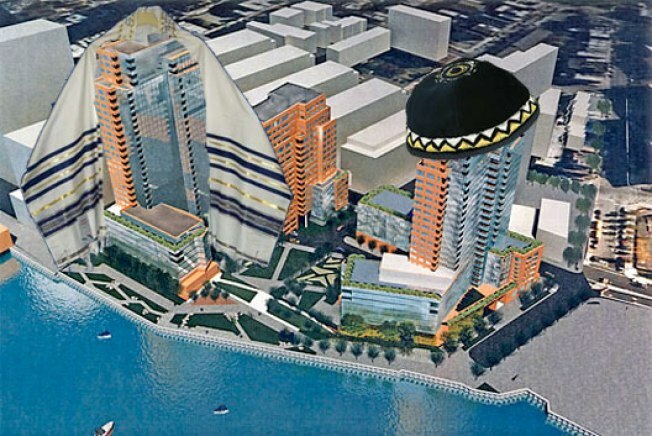 Holy War Derailing Massive Williamsburg Waterfront Development? When he's not mixed up in the madness that is Warehouse 11, developer Isack Rosenberg has been trying to win approval for his three-tower, 801-unit Rose Plaza plan on the South Williamsburg waterfront, near another riverside behemoth, Schaefer Landing. But the Observer's Eliot Brown reports today that Rose Plaza "appears imperiled" as it heads toward a crucial City Council rezoning vote (the land is now a lumber yard). Why? Well, the neighborhood's new councilman is against the plan, and complaints about the project are similar to what we've been hearing about fellow waterfront megaplan New Domino: Too little affordable housing and too big a population boost for the area. Oh, and then there's this: civil war, Hasidic Judaism style! By now the 2006 split in the powerful Satmar sect has become the stuff of legend, so we'll spare you the details, but just know that Rosenberg is a member of the faction following one son of the late Grand Rebbe Moshe Teitelbaum—meaning the followers of the other son are operating against Rose Plaza. Allegedly. While Rosenberg's lawyer says, "Unfortunately, as a result of the politics in Williamsburg and the split in the Satmar community, I believe the opposition has developed regarding Rose Plaza," others seem to think that it's Rosenberg's financial hurdles and lack of development experience that may stick a thorn in Rose Plaza.